We are just over half way through year 1 and the ladies have made remarkable progress in the past few months. The energy in the group is very encouraging and it shows in the work they have produced so far. I had an enquiry today about participating in City and Guilds and she asked me what was involved and how long was the course. Well the second part was easy, Level 1 is spread over 1 year, following the scholastic school year there are 36 weekly sessions, each session being 3 hours. Level 2 is the same and level 3 is spread over 2 years. Each level is divided into units which can be passed separately. The first part of her question wasn't so easy to answer, as the course involves a great deal. using different mediums, cutting, shaping, collaging, layering. Learning the basics of fabric identification, fabric choices, thread choices, tools and equipment and so much more. It teaches you most importantly time management, how to think about your work as an artist. I try to encourage the students to think of themselves as a designer, to encourage their confidence and bring worth to the items they are making. Unfortunately the art world still finds it difficult to accept art made with textiles is an actual piece of art, I don't know how they can make this assumption when embroidery on garments, furnishings and tapestries in history were so expensive that one garment could cost an embroiderers whole years wages. May be it is simply because these wonderful items have not survived as paintings and sculptures have, but to say the skills involved in embellishing fabrics with intricate stitching is less skillful than painting or sculpting to me is absolute nonsense! To be very sexist, if the task of embroidery was solely a man's labour as it was in Opus Anglicanum times and kept as a man's craft such as painting or sculpting then may be the story would be different. There is a very enlightening documentary "The Story of Women and Art" by Professor Amanda Vickery on how women have been shunned from the art world in the very early years and how some women fought to be recognised as artists equal to their male counterparts, of course these days there is less of that but it still goes on and some day hopefully textile art will be revered as much as paint upon a canvas. In essence then, Level 1 gives you a great grounding for level 2 and 3, it's where you begin to learn the basic skills and the confidence to bring value to your talents. It encourages growth of ideas to design in culmination to a finished product that encapsulates your interpretation of a given subject, be that an abstraction, an impression or a realistic view. This week we were catching up, I think since Christmas we have learned quite a lot of techniques, so as not to be labelled a slave driver I am giving them a rest from anything new until after half term. Although Ann, I have to say you are a Wiz, I am not entirely sure how you manage it but time management is not something you need any help with it seems. I wish I had your sense of work ethic. Below is a wonderful machine embroidered panel that Ann has adapted from another pattern and put her own spin on it. Beautifully sewn and executed with lots of techniques in one piece. 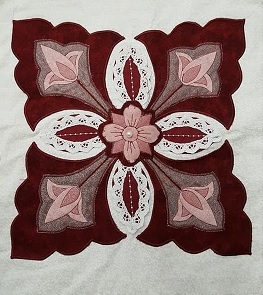 Applique, shadow applique, decorative machine stitches, lace application to name a few. This will form 1 of the 6 finished machine pieces required for level 1. Ann has produced a sample that is over and above the size that is required, but shows her enthusiasm for the work she produces. Ann has a computerised embroidery machine where by she can take a drawn pattern and digitize into an embroidery. Many people feel that using these machines is cheating but there is another level of skill involved when making your own digitised patterns. 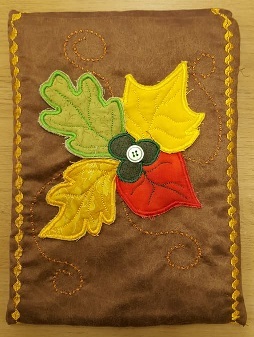 Computer skills and knowledge of stitch infills, and line design is not something that is easily achieved with the wave of a magic wand. Well done Ann I love your little froggy I think he's gorgeous and well done for bringing computer embroidery into your ipad cover. Below we have one of Kay's finished machine stitched pieces. She has used the weaving strip method as her background and highlighted some of the areas with satin stitch, printed on quavers and semi quavers and then overlaid on the top appliqued notes from a piece of music that reminds Kay of her father. The stave is satin stitched and then outlined with a row of silver straight stitch and unfortunately the picture doesn't show this off nearly as well as it looks in real life. A wonderfully simple but evocative piece of work Kay stunning !!! Way back we did a workshop on couching and printing. Kay has made this most wonderful tote for her hairdryer. The fish have been printed from an indian wood block and embellished with beautiful hand embroidered satin stitch in a chevron pattern and the cords around the tote that help the give it structure have been hand couched. 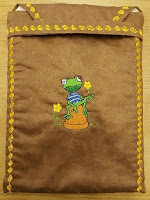 This piece will be one of three of Kay's finished hand embroidered samples required for level 1. A work in progress now from Celia who used last weeks stenciling session to embellish her woven background. Celia has named this piece "Early Marine Life" the amoebic like patterns have been taken from the pattern on one of the fabrics used in the woven piece. Celia is now going to use her machine to embellish the piece further. Celia will admit that machining is not her favourite method of stitching but I am hoping to change her mind in the coming weeks as she has already nearly completed all three of her hand embroidered samples required to complete level 1. Can't wait to see the completed work. This is Linda's work in progress, she has woven these lovely lavender grey and damson colours together and now embellishing with a super variety of hand stitching in tonal threads, She has printed flowers onto the background and used her machine to satin stitch some of the fabrics to highlight certain areas. Well done Linda keep adding the stitching and make it even more scrummy! No blog next week, we're having a break for half term! If you want to know more about the course please pop into Busy Bees Patchwork and I will be happy to explain the contents of the course. Better still keep Saturday 21st July 2018 free and come and see our exhibition at Duffryn Community Centre and be inspired by all the wonderful work the ladies have crafted over the year. Back on the 28th February!